Roger Bailey as a fulltime professional Heart of England tourist guide, offers a range of private guided walking and coach tours for prebooked groups, which include Coventry, Stratford upon Avon, Warwick, Oxford, Birmingham, The Cotswolds, Leicester, Royal Leamington Spa, Rugby, Black Country and Black & White Villages plus much more. He covers Gloucestershire, Herefordshire, Leicestershire, Northamptonshire, Oxfordshire, Rutland, Shropshire, Staffordshire, Warwickshire, West Midlands and Worcestershire. Roger as a qualified tourist guide can help your organisation with familiarisation trips, hotel & airport transfers, meet & greet, support for conference delegates, VIP's and shopping breaks. He entertains, informs and cares for your customers. Roger is based at a location in Coventry, near the NEC and Birmingham Airport, a short distance from Stratford upon Avon and Birmingham. He also acts as a supplier of additional Blue Badge Tourist Guides if you have have need of more than one tourist guide at the same time. 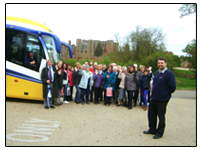 Besides working for various educational establishments, he supplied the tourist guides required for the heritage and cultural tours for the 2009 World Rotary Convention held at the National Exhibition Centre near Birmingham. 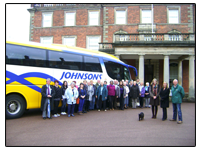 Many 100's of delegates were looked after each day on tours being booked within the convention.